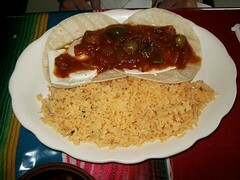 Ordinarily, the huevos rancheros at Tacos El Charro come with beans, but Rich asked for rice instead. The photo does this meal no justice. Once he started eating, I was overcome with food envy. Breakfast time or not, I'll be back soon to have a plate of my own. This Tacos El Charro meal was rated: 6.5. Sunday, June 05, 2005 by Jonah.